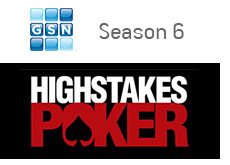 Details for the sixth season of High Stakes Poker have now been released. The new co-host is Kara Scott, as was rumored for the past couple of weeks. Scott "will report from the High Stakes Poker suite, interviewing poker players about poker strategy, big hands and the table dynamics." The first episode will premier on February 14th, 2010 (Sunday) at 8:00 pm. There will be two encore episodes at 11 pm and 2 am. There will be a minimum cash buy-in of $200,000.